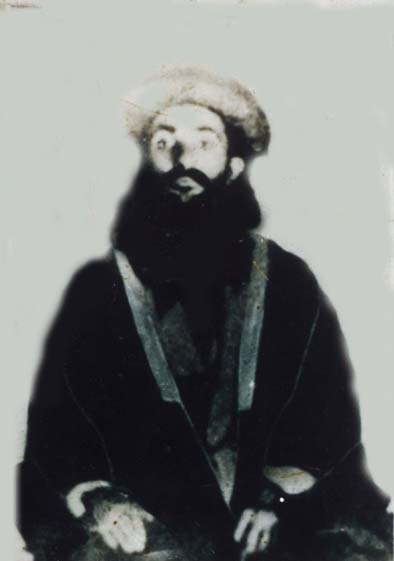 Shaikh Ḥussein was born in 1888 in Kirpchina in northern Iraq. He was the oldest son of Shaikh ʿAbd al-Qādir. He had a pious upbringing and started studying the Qur’an and Sharīʿa from early childhood. He was reputed for protecting the weak and fighting against all forms of injustice. Shaikh Ḥussein took part in a number of battles in World War One against the Russian army which attacked from Iran. He also led several battles against the colonial British army in the north of Iraq. In one of those battles Shaikh Ḥussein captured eighty soldiers and two officers and killed many others. This led the British authorities to send to Kirpchina a large military campaign that resulted in the emigration of Shaikh ʿAbd al-Qādir and his son Shaikh Ḥussein. Shaikh Ḥussein’s practice of renunciation and austerity was extraordinary even in the hight standards of the Sufi Shaikhs. His food was confined to barley bread and colocynth, which is a very bitter tasting plant. He would often refrain from drinking water even in the hot summer. For a whole year his daily food was confined to a small spoon of honey and little tea. In his last years, he was in continuous fasting, and he would eat very little. In the later stage of his life, Shaikh Ḥussein became so frail because of his austerity that he needed his servant to raise his hand for him to greet his visitors. The Shaikh’s private residence was a small, dark room under the ground where he would spend most of his time in worship, leaving it only for a few hours to meet people. Shaikh Ḥussein also used to go to worship Allah on the mountains after midnight where he would lie among the thorny weeds until sunrise as part of his spiritual struggle. The Shaikh loved the mountains and enjoyed wandering there. He was, therefore, known as “Sulṭān al‑Jibāl (The Sultan of Mountains)”. Shaikh Ḥussein al‑Kasnazan was very generous. He used to receive lots of donations from various people, but he would never use the money for his or his family’s needs. He used to say: “This money is not for me but for the poor. Neither I nor my family should enjoy this money.” The Shaikh would spend all his resources on the less fortunate and the needy. He appointed monthly salaries to many poor families and those with orphans. He used also to buy whole villages from their landlords and donate them to the farmers who lived there. Once a widow asked Shaikh Ḥussein for some money for her orphaned children at a time when he had nothing. So he took off his gold‑plated teeth and gave them to the widow to sell for the money she needed. The Shaikh established a religious school in Kirpchina and appointed teachers and students to study the Hadith, grammar, fiqh, and other religious sciences. Over twenty students used to study in the school every year. The school produced every year graduates who specialised in various religious sciences. Before departing this world in 1941 CE, Shaikh Ḥussein said: “I have seen the Prophet (PBUH) in my dream. He told me that my brother Shaikh ʿAbd al-Karīm should succeed me”.